You can almost see the weight of 60 years of barbecue tradition bearing down on the shoulders of Wayne Mueller, third generation heir to the Louie Mueller Texas barbecue dynasty. I say “almost” because 1) Wayne is at least 6’4″ and built like a linebacker and it would take a lot of weight to double him over, and 2) more practically, it’s hard to catch a glimpse of the guy as he darts around the perpetually smoky main dining room of Louie Mueller Barbecue in Taylor, Texas. Of course I’m speaking figuratively — the burden to which I refer is traditional, not physical. And although Wayne’s physical bearing may help alleviate the daily grind of producing world class barbecue, it doesn’t offer much protection (other than maybe a thick skin developed over many years in front of a firebox) from the inevitable and unavoidable opinions that Louie Mueller Barbecue just isn’t the same since Wayne’s father, Bobby Mueller, passed away suddenly in 2008. To be clear, such suggestions are completely unfounded. 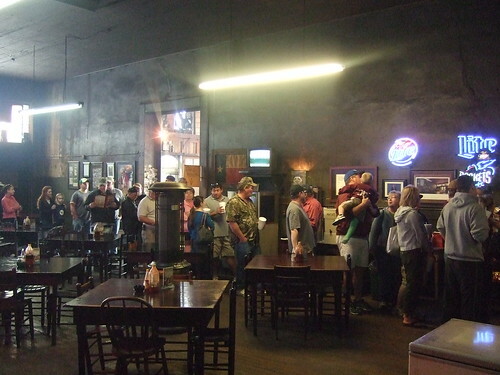 Louie Mueller Barbecue is easily as good as, and possibly better than, when the James Beard Award-winning Bobby Mueller ran the operation. It’s obvious that whatever tradition and goodwill that Louie Mueller garnered over the decades will not go gentle into that good night if it’s up to Wayne Mueller. On a recent Saturday I stepped up to the counter at Louie Mueller Barbecue and was warmly greeted by Wayne himself, who was working the carving block just like his father did before him. We chatted briefly and Wayne stepped over to shake my hand, but being covered from fingers to elbows with the carbonized debris of barbecued meat, he offered a sweaty elbow bump in exchange. I ordered a half pound of the fatty brisket and in no time a quivering, steaming pile of meat lay before me on the counter. The crust on this brisket was coarse and complex, and of the same dark brown/black color of the smoke-caked walls of the main dining room. You might imagine that if someone got up the gumption to take a big lick of the dining room’s walls, it would taste something like the crust on this brisket. Louie Mueller’s rub is famously simple and effective: coarse ground black pepper and salt. That such a complex overall flavor can be imparted through barbecued meat is, in my opinion, a tribute to Mueller’s decades-old brick barbecue pits — layers of smoke have built up over the decades to infuse a rich smokiness to the meat that just can’t be duplicated elsewhere. Post oak wood is used as the smoke source (“Where do you get your wood?” “From trees!”) and adds another layer of flavor complexity. On this day, the slices of fatty brisket were exceptionally moist and tender, with a dense web of gelatinized collagen that had seeped into the surrounding meat. The fat had been completely rendered and had the texture of butter and an exquisite flavor of smoked meat. The crust was pleasantly peppery, not too much salt, and a slightly bitter note of chocolate and coffee. After I took the first few bites of this brisket, I announced to my tablemates, “This is the best brisket I’ve ever had.” Which is something. I’ve had the brisket at every one of Texas Monthly’s top five barbecue joints, and up until this time, I had Snow’s BBQ brisket as my favorite. But today, the barbecue Gods aligned the planets over Taylor, Texas: the perfect piece of brisket, perfectly smoked, perfectly seasoned and perfectly served with a generous helping of sincere friendliness and tradition. As one of my dining companions so thoughtfully suggested: Texas barbecue joints are a lot like human beings, they have good days and bad days and you’re never sure who’s going to show up. Which is both frustrating and exhilarating at the same time; will I get a piece of meat as tough as shoe leather, or a transcendent slice of smoky, fatty goodness? With Texas barbecue, as with people and boxes of chocolate, you never know what you’re gonna get. Wayne Mueller has stated publicly that his vision for Louie Mueller Barbecue is to maintain both tradition and consistency. 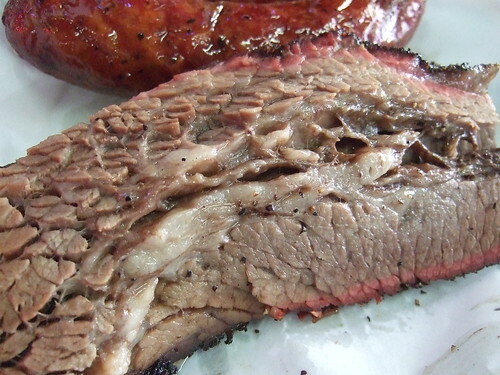 I can see how some people believe that when Louie Mueller is “on” (which is more often than not), when it’s having a good day, when everything is clicking and smoke and tradition soak everything, it’s the best barbecue in Texas, and therefore the world. This blog entry was originally posted 9 March 2010 on the www.29-95.com website. This entry was posted in 29-95, Barbecue, Favorites, Food, Food for Thought, Personal Profile, Texas and tagged bbq, brisket, louie mueller barbecue, taylor texas, wayne mueller. Bookmark the permalink. http://pitchertaker.blogspot.com/2009/03/lunchtexas-style.html Wayne is the best, and the last time we were there, we talked briefly — great guy.